"An altercation between two families caused the violence, but authorities provided no details about the nature of the dispute. Belinda Espinoza, the daughter of Juan Espinoza Sr., said her family grew up with the suspects and knew them well. She was not at the house when the shooting occurred"
Make your own opinions. A simple search, no guessing..
so realistically what can we do? get all that from their names or what? or did being low by the border give you a big clue?? Was that comment meant to encourage further discussion down that path. If so, I apologize as I read it differently. Sounds like mexican gangbangers doing mexican gangbanger #. is that the excellent material for finding the root of the problem you were talking about? Whaaa....nobody agreed with me so I'm going home. Grow a pair, will ya. its just frustration. i dont want people to agree with me. the opposite. i want people to discuss things and actually read the posts. i do not want guns banned and isaid it in the OP yet thats all people are saying. saying thats my agenda. like i said its just me being frustrated at not being able to have a discussion. i want to hear from people that do not agree with me. at the least though i want them to be honest at what this is about. it is not about me wanting guns banned. Fact is, you got called out and exposed for what your underlying reason was and you took exception. If YOU don't like firearms, and decide not to exercise your own 2nd amendment right, great!!! All the power to you, I support you in that decision. However, do not try to push your brand of anti-gun thought upon those that disagree. people keep saying i am anti gun and want them banned. this is not true. 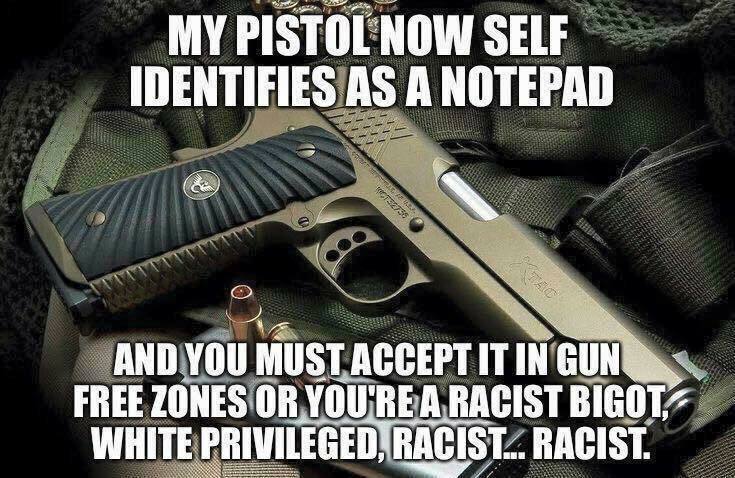 i own a gun. Want to discuss what is causing people to act out violently toward each other? OK....let's take one reason. DEMOCRATIC politicians calling for mob violence to "resist" the legally elected POTUS. Politicians that claim there cannot be any civility. Politicians that claim to their followers to confront "them" wherever they are, and harass them at every opportunity. How about discussing that aspect? i do not support mob violence. 3 pages in and people are still saying i want guns banned. I never claimed that you did....just that you focused upon the GUN only....not the reason these people felt they needed to break the law by killing others. Drop the "gun" motive....period. You will get a more honest response. How many times do WE have to say it is not the gun that is the problem....it is the person....PERIOD. If you can get past using the word "gun" in your search for a solution, you may find a more receptive and constructive discussion. Killing has been happening since mankind began to walk on 2 feet, leaving their hands free to use a tool to strike another person. So, you agree politicians shouldn't be calling for violence to push their incessant need for power. What have you done to address that? I have done first hand research on these stories to come to the conclusion that it is all about regaining power. The followers are merely their tools to achieve that outcome. They don't care how many are hurt or die, after all, BY ANY MEAN NECESSARY is their siren call. Voting at the ballot box against these agendas is our ultimate tool at this point. I speak to as many people as I can trying to reveal this agenda....but people do not want to hear it....do you? It is indeed. That path will lead to the questions that may actually make a positive change for our society down the road. Do you shy away from that path? I really wish there was another way forward. I kind of wish this reality weren't designed so, but it is. Probably for a reason. Probably for us. Probably for growth forward. It will not be fun and hearts will need to harden. That is why I say, this will get a lot worse (by necessity) before those questions will be asked. If chaos is the ultimate goal of our rulers to keep us divided and them in power, they will resist the path will the full force of their judicial power. There will be a lot of people locked up behind bars for merely speaking 'words' when the populace gets bold enough. So, you agree politicians shouldn't be calling for violence to push their incessant need for power. What have you done to address that? not done a thing to address it except answer when asked. i speak to people on here. i dont really like talking to people in real life. just my one buddy that eats lunch in my office. i enjoy talking to him. other than that i just try to stay away from most people. i dont go to the gym much anymore but when i do we definitely dont talk about anything like current events or politics. Deport all progressive democrats and ban the party. Make being a Democrat a felony punishable by life in prison. Ask your parents or grandparents. They will tell you that In the 50's and 60's, high schoolers had gun racks in the backs of their trucks, some with guns in them all the time, even while parked in the parking lot. Most boys carried pocket knives and nobody went berserk when they took them out to clean their fingernails or peel an apple. You usually got your first one around age six and your first gun around twelve. What happened beginning somewhere in the seventies until now? What has changed in schools? What has changed in communities?